Environmental Design is becoming an increasingly significant agenda for many manufacturing companies and yet there is no standard to their approaches, strategies or their levels of execution. Applying Design for Environment (DfE) methodologies to develop a more sustainable supply chain has formed procedures and techniques which allow designers to integrate these methods with environmental supply chain management. Design for Environment as a Tool for the Development of a Sustainable Supply Chain aims to define relevant target specifications for a product throughout its life cycle; from conception and design to the end of its operating life. Be considering this new approach to the supply chain, environmental responsiveness can work in tandem with sounds business management. The usual focus on suppliers, manufacturers and customers is expanded in Design for Environment as a Tool for the Development of a Sustainable Supply Chain to include stakeholders such as government bodies and recycling companies. The influence of these additional groups is analyzed alongside concepts such as: Product life cycle development aimed at environmental impact minimization; Supplier selection and management based on environmental criteria; and Marketing and communication choices which increase the value of environmentally sensitive products. 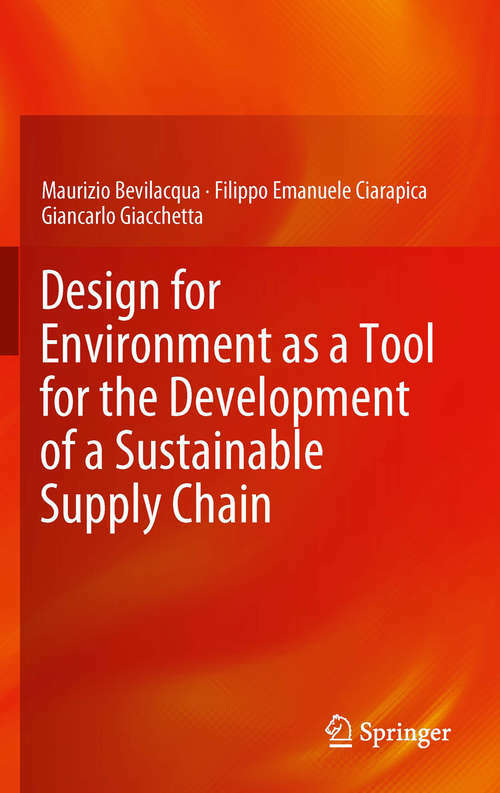 By including several case studies alongside theoretical topics, Design for Environment as a Tool for the Development of a Sustainable Supply Chains acts as a foundation for professionals across the supply chain, from industrial designers to marketing and sales departments, who are involved in environmental issues.